Eukaryotic cells contain an estimated 3,000 sequence-specific DNA-binding proteins. These important proteins, acting either with or without a protein-specific small molecule co-regulator (ligand), control all aspects of genomic DNA activity including gene expression, DNA replication, and DNA repair. Mediomics is applying its proprietary fluorescence platform to develop in vitro assays capable of rapidly and sensitively quantifying both DNA-binding proteins and their ligands. The common property of all sequence-specific DNA-binding proteins is their ability to bind with high affinity and specificity to a DNA duplex containing a unique nucleotide sequence, i.e., the DNA-binding site for the protein. Mediomics’ novel assay platform relies on this common characteristic. A DNA duplex containing the sequence-specific DNA-binding site for a given target protein is split into two DNA half-site duplexes each having a short single-stranded overhang. These single-stranded extensions are short enough so that in the absence of the target protein little spontaneous re-association occurs. When the target protein is present, however, its high affinity for the full-length DNA sequence binding site will drive the re-association of the two half-site DNA duplexes. This re-association can be sensitively detected by incorporating an appropriate fluorescence probe into each one of the two DNA half-sites. 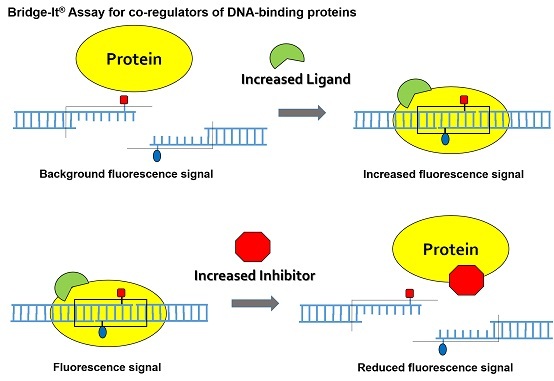 The presence of the DNA-binding protein is detected as a change in fluorescence signal (Figure 1). A simple variation of this basic platform design allows a DNA-binding protein to function as a sensitive biosensor for its specific co-regulator or ligand (Figure 2). The ligand (target molecule) binds to the specific binding site on its specific ligand-dependent DNA binding protein. This small target molecule recognition event serves to activate the DNA-binding site on the DNA-binding protein. The fluorescence signal generated will now be reporting the presence of the co-regulator (ligand). The Bridge-It® cAMP assay is an example of such an assay design. 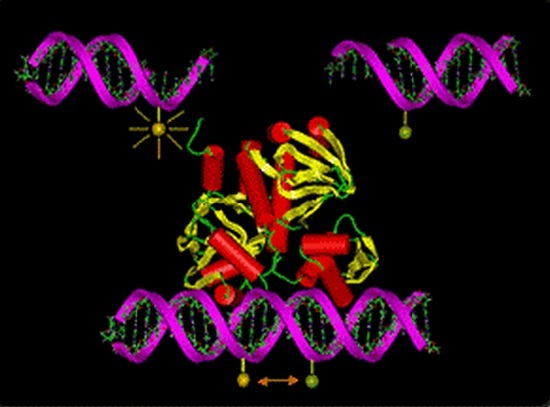 Mediomics novel DNA-binding protein assay design utilizes a two fluorophore system (a fluorophore donor and a fluorophore acceptor). A DNA-binding protein, when present in the sample, will bind with much greater affinity to the annealed DNA fragments, since the annealing restores the functional binding site for the protein. Such preferential binding will drive the annealing of the two DNA fragments, bringing the two fluorophores into close proximity (Fig. 1). Thus, the presence of DNA-binding protein may be quantitatively measured either as an increase in fluorescence signal of the acceptor fluorophore or as a decrease in fluorescence signal of the donor fluorophore as a result of fluorescence resonance energy transfer (FRET) between the two fluorophores (Figure 3). Thousands of different DNA binding proteins and their ligands function as the “on-off” switches that regulate gene expression. Thus, DNA binding proteins and their ligands are of research, clinical, and environmental interest. Mediomics novel sequence-specific DNA-binding proteins fluorescence assay method has product applications in laboratory research, clinical diagnosis, high-throughput drug screening, and for monitoring levels of hazardous chemicals, controlled substances, and infectious agents that may be used for biological warfare. In addition to kits for detecting individual target molecules, combination kits useful for measuring and comparing activity of many DNA binding proteins in a sample simultaneously can be developed. 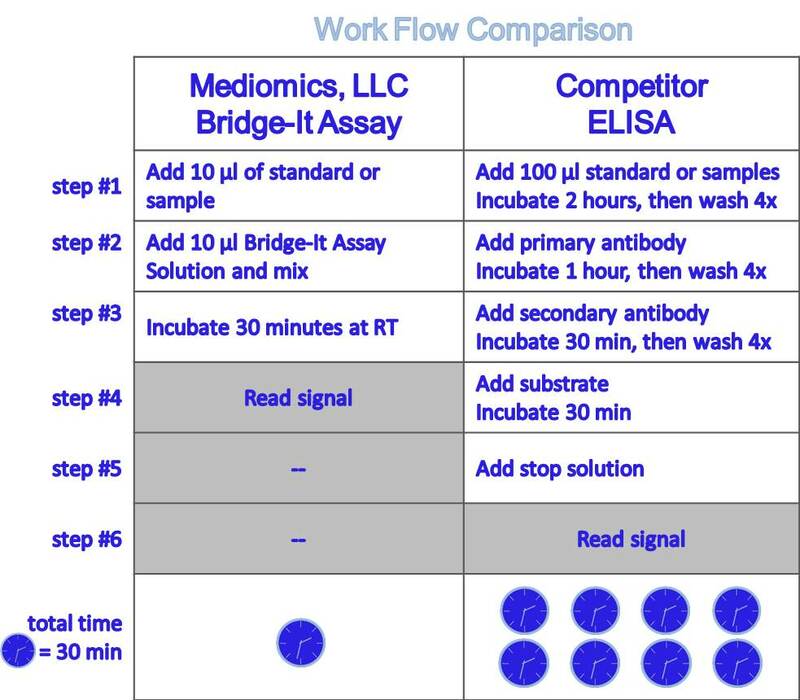 The Bridge-It® Assay is a simple, rapid, safe, and affordable method for measuring the activity of DNA binding proteins and their co-regulators. 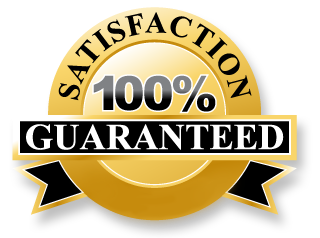 It is sensitive, rapid and homogeneous procedure that requires no technical manipulations other than mixing the test sample with the reaction mixture. It does not require the use of antibodies or radioactive probes. It is flexible with respect to the mode of signal detection and the fluorescence probe used. It is amenable to performance of simultaneous multi-color detection of several different DNA-binding proteins. It can be formatted for research use as kits products and in arrays for purposes of high-throughput screening. The Bridge-It® Assay requires much less time, effort, and reagent than enzyme-linked immunosorbent assay. See how the work flow for each assay compares in the table below.